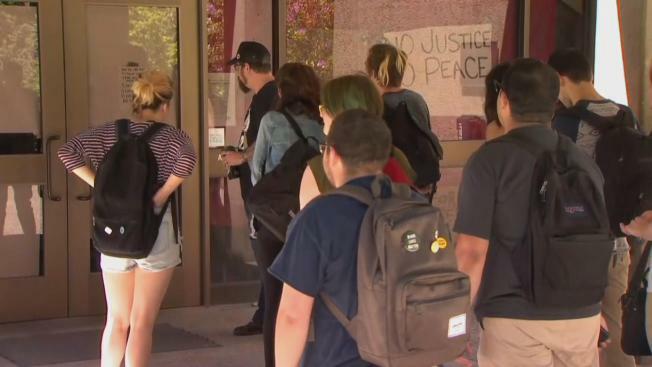 A large group of University of California, Santa Cruz students locked themselves inside a campus building and are threatening to stay there until their demands, centered mainly on a dire need for housing, are met. Nearly 200 people, many of whom are members of the Afrikan Black Student Alliance, took over Clark Kerr Hall for a sit-in that started Tuesday. The demonstration kicked off with a march, after which students made a beeline for the university's main administrative building and blocked its entrance with chairs and tables. "The Afrikan Black Caribbean identified students have spoken," the group said in a statement. "The issues on this campus far exceed anything easily fixed." The alliance is demanding a four-bedroom low-income housing cooperative for the benefit of "historically disadvantaged students," the statement said, adding that the Afrikan Black Student Alliance wants to manage the property. "Many [Afrikan Black Caribbean] identified students have been forced to take leaves of absences, withdrawals, or have not been able to attend UCSC at all due to limited, and unaffordable housing options," the statement said. To that end, protesters also want a four-year housing agreement to live in the Rosa Parks African American Themed House. "Guaranteeing this would provide a viable living option to all [African Black Caribbean] identified students regardless of housing status and college affiliation," the statement said in part. Further, the group is pushing for the exterior of the building to be painted red, green and black. "These Pan-Afrikan colors represent Black liberation, and represent our diaspora, and the goals of our people," the alliance continued in its statement. 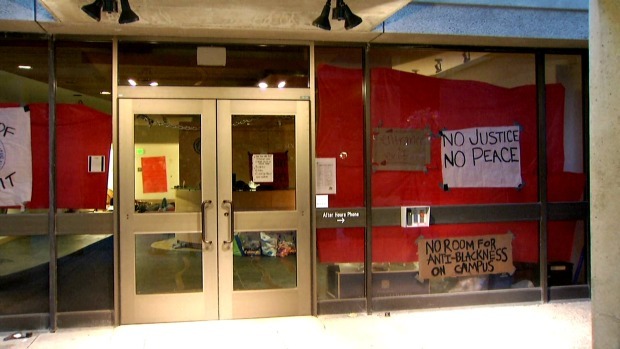 UC Santa Cruz must also offer diversity training to its student body, demonstrators said. Footage from the scene shows students sleeping and reading on the floor while others sat on chairs, using their laptops. The protesters have also stockpiled food to tide them over. Through social media, the group reached out to supporters, asking them to show up and volunteer. About 20 additional people arrived at the building Wednesday and were let in. A spokesperson for the group, who declined to be identified, said the alliance is growing in number and determination. "The enthusiasm level is wonderful," the spokesperson said. "We're all doing good. We're good." University Chancellor George Blumenthal plans to meet the group of students on Wednesday. In a statement issued Wednesday, the university said, "We’ve taken some steps forward, including hiring a recruitment specialist and a retention specialist, and continue to discuss how we can make sure that all students feel supported and have a sense of belonging. The campus is sensitive to the needs being expressed by the students." Protesters said they've shortened their list of demands that was already rejected by the chancellor last month.